Review by Nathan Hinkle, Feb. 29, 2016, 6 a.m. The Volt 100 and 200 are Cateye's low-cost entry-level headlights, primarily designed for safety visibility rather than lighting up a dark path. Cateye sent me a Volt 100 to test this fall, as the Volt 200 wasn't available yet at the time. 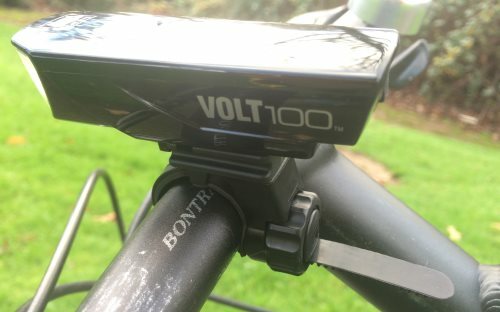 Although its output is much lower than the many high-powered headlights which are quickly approaching car headlight outputs, the Volt 100 is a good option for riders on a budget who primarily ride on lit urban streets, or weight-conscious road bikers looking for a light-weight backup for long rides that stretch into the evening. Although advertised as putting out 100 lumens, the Volt 100 was actually measured at 160 lumens on high by MTBR. My own runtime testing shows that the output is reasonably well regulated, with the light remaining above 80% of its initial output through the first hour, maintaining 75% after the claimed 2 hour battery life, and finally dropping into flashing mode after 2:25 hours. The internal lithium battery is easily recharged by a micro USB port which supports fast chargers. The Volt 100's beam makes good use of the limited light output. 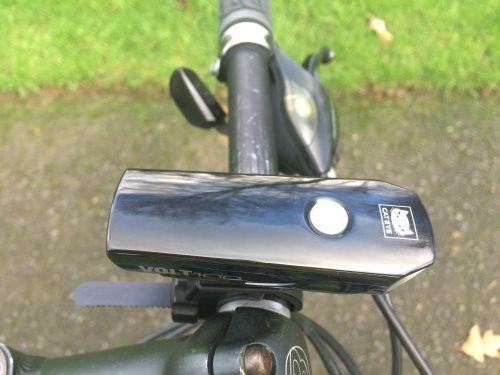 Whereas many bike lights have a symmetrical, circular beam, the Volt 100 shines more light down towards the roadway and less up into the sky. This effective use of optics results in more light on the road than other lights with a symmetrical but higher-output beam. 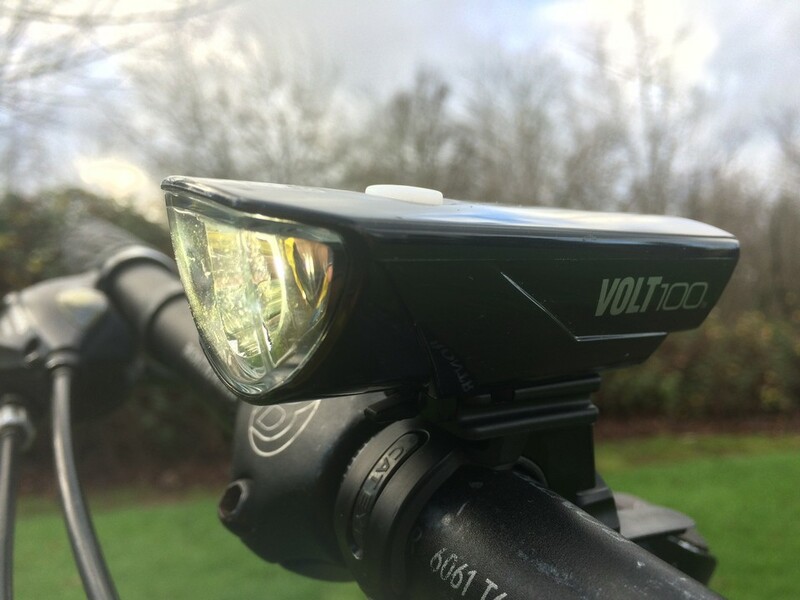 Unfortunately the Volt does not have a hard beam cutoff to prevent shining light into the eyes of oncoming drivers and cyclists, but at these output levels that is less of a problem. Operation is simple, with only 3 modes to choose from. A 1-second press-and-hold of the power button turns the light on, and a single quick press switches between high and low output. A quick double-press switches between steady and flashing. Another press-and-hold turns the light off. The flashing mode is unremarkable, flashing the LED a few times per second. The Volt offers no steady-flash or subtle pulse mode. The Volt 100 uses the same mount as all of Cateye's other Volt series headlights. I have mixed feelings about Cateye's FlexTight mount. It's very sturdy and works on handlebars with abnormally shaped cross-sections (like some road bikes). However, when tightened, the excess plastic from the mount sticks out the back, and is easy to scratch a wrist on. The mount requires no tools to install, but is not as quick to move between bikes as rubber strap mounts like those found on Serfas, Bontrager, and Light & Motion's headlights. While you won't be using the Volt 100 or 200 for trail riding, it's a strong choice for urban riders on a tight budget. It retails for $35, but is often available online for under $20, making it a great value in terms of performance per dollar. Few lights are available in this price range from reputable manufacturers. The Volt 100 and 200 are a great choice for people who only ride at night occasionally, typically bike shorter distances, or primarily ride on well-lit urban streets. If you need something with a stronger output, consider some of the higher-powered lights in Cateye's Volt series, or check out our full list of recommended headlights.